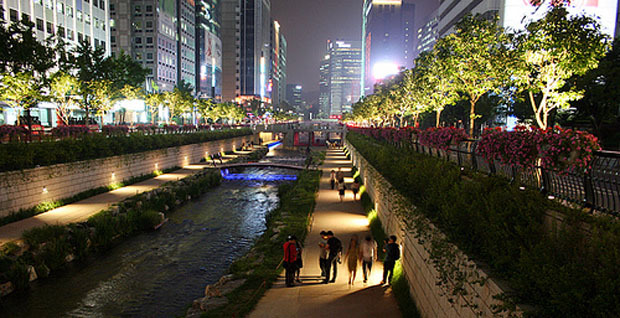 Below is an excellent 5 minute video from Fast Company describing why in 2003, city officials in Seoul decided to demolish a two-storey freeway feeding directly into the centre of the city...and replace it with a stream. I actually visited Cheonggyecheon when I was in Seoul last year and the river had seems like it was always there, and in fact it was. The demolished thoroughfare was built above the site of an ancient stream. Now, Cheonggyecheon is a thriving tourist attraction and located along it are some of the biggest shopping hubs in a shopping mad city. 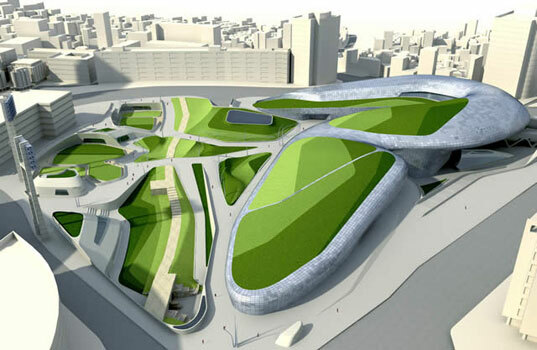 Nearby at Dongdaemun, Zaha Hadid has a public plaza and cultural centre under construction on the site of a former baseball stadium. In Richard Sennett's 'The Fall of Public Man' he clearly explains how it has come to pass that public space development in cities during the 20th century have dramatically shaped the individual and enforced a disconnect with the public sphere. "The idea of space as a derivative from motion parallels exactly the relations of space to motion produced by the private automobile. One does not use one's car to see the city; the automobile is not a vehicle for touring... The car instead gives freedom of movement; one can travel, uninhibited by formal stops, as in a subway, without changing ones mode of motion, from bus, subway or elevated to pedestrian movement, in making a journey from A to B. The city street acquires, then, a peculiar function - to permit motion; if it regulates motion too much, by lights, one-ways, and the like, motorists become nervous or angry." Today, we experience an ease of motion unknown to any prior urban civilization, and yet motion has become the most anxiety-laded of daily activities. The anxiety comes from the fact that we take unrestricted motion of the individual to be an absolute right. The private motorcar is the logical instrument for exercising that right, and the effect on public space, especially the space of the urban street, is that the space becomes meaningless or even madening unless it can be subordinated to free-movement. The technology of modern motion replaces being in the street with a desire to erase the constraints of geography."